8 How to Apply FCI UP Vacancy Watchman Bharti 2017 Application Form online @ fciupjobs.com? Good news for the candidates who have passed 8th class from a recognised school board or looking for FCI Uttar Pradesh Vacancy 2017-18. Here is good news that Food Corporation of India Uttar Pradesh Region released FCI UP Watchman Vacancy 2017 Notification to recruiting 408 watchmen in the Uttar Pradesh state. Eligible and interested candidates who want to do job as a watchman in Uttar Pradesh FCI can download FCI UP Watchman Recruitment 2017 Advertisement and Apply FCI UP Watchman Recruitment Online Application Form 2017 before last date 06 November 2017 through official website of FCI UP. Official website to Apply FCI UP Watchman Jobs 2017 Online Application Form is fciupjobs.com. Direct link to download FCI UP Vacancy Watchman Bharti 2017 and Apply FCI UP Watchman Online Form 2017-18 is given below. There are thousands of unemployed candidates who are eagerly looking for 8thh Pass Govt Jobs 2017-2018 in Uttar Pradesh state. Now there wait is over and Uttar Pradesh Food Corporation of India is comp up with 408 Jobs in state. 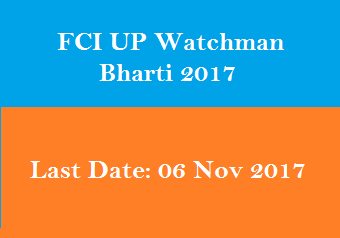 Start date of UP FCI Watchman Bharti 2017 Online form is started now through the official website. Candidates will be select through the performance in the written examination and Physical test PST / PET. We provided here direct links for the FCI UP Watchman Syllabus 2017 Pdf in Hindi and FCI UP Watchman PST PET standards details. Applicants who are going to apply FCI UP Vacancy Watchman Bharti 2017 Online Form must have attained minimum 18 years of age. More details about FCI UP Vacancy Watchman Recruitment 2017 like Eligibility, Educational Qualification, Age Limit, Selection Process, and Pay Scale Salary of UP FCI Watchman, Application Fee and Important Dates etc are given below on this page. Educational Qualification for FCI UP Watchman Recruitment 2017: Candidates who are going to apply online must have passed 8th class. For more details download official advertisement. FCI UP Watchman Age Limit: Candidates must have attained minimum 18 years of age and not have attained more than 25 years as on 01 September 2017. Application Form Fee: Check official advertisement. Written examination will consist of a single Examination Paper for duration of 120 minutes. The WRITTEN TEST will comprise of 120 Multiple Choice Questions of General Knowledge and General Awareness, Numerical Aptitude and Reasoning, Language (Hindi and English) and Current Affairs. Note: All questions carry equal 1 mark. There will be no negative marking. 2. The Question Papers for Written Test will be bilingual i.e. in English and Hindi both. 1000 Meters Race – 5 Minutes in one Go. FCI UP Watchman Admit Card 2017 Before 10 days of exam date. How to Apply FCI UP Vacancy Watchman Bharti 2017 Application Form online @ fciupjobs.com? First of all visit official website of UP FCI. After that download and read official notification carefully. Enter all details carefully in the online form. Upload scanned document and click submit button. We have glad that you visited our website and checked FCI UP Vacancy Watchman Bharti 2017 Recruitment Online Form fciupjobs.com. Keep checking this website for latest govt jobs 2017-18 and upcoming Government Jobs updates. Bookmark this page for latest updates about FCI UP Watchman Exam Date 2017 Admit Card, Result Cut off & Answer Key. If you have any query about this article then comment below in comment box. We will reply as soon as possible.